and it says in the following scheme that there is V+, V- and gnd, what does V- stands for? Just what it says negative supply voltage. 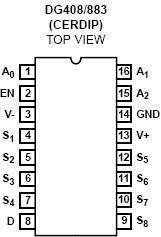 That chip normally runs with 15v +- but supports a lot of different configurations. If you want to use it with positive voltage only connect v- to gnd as the datasheet says on page 6. If you were running from dual supply, like +12V/-12V, V- would be -12V. If running from single +5 supply, V- goes to Gnd, per page 4.